ReARM ~ RedNev's Blog: Who's singing? You or the computer? Who's singing? You or the computer? I've just been listening to BBC Radio 2 late at night and I have been dismayed - not for the first time - by how many singers have, in my judgement, had their voices adjusted by Autotune. If you can't sing in tune, you have no right to fob off a fake product on the public. 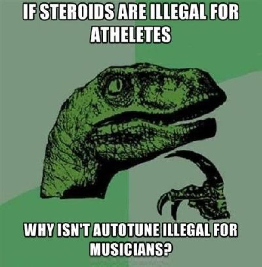 Judging by this image I found on-line, I am clearly not alone in regarding Autotune as the musical equivalent of sports people using performance-enhancing drugs. In both cases, the public is being conned. For the record, I am on at least 18 albums (possibly more), and I know I can sing in tune without computerised assistance. That's not just my opinion: it's also the view of a friend who has perfect pitch. And I'm just a local, mostly amateur, singer. I would have thought a leftie like you would appreciate a technology that eliminates the tyranny of talent and makes all singers equal? An egalitarian levelling of the playing field in music? Hadn't thought of that - now what would Marx say? Spoons - just stirring it up? St Patrick - Southport's most famous son?